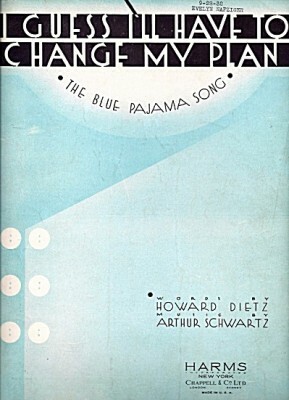 “I Guess I’ll Have To Change My Plan” was written for the 1929 revue The Little Show and was introduced by Clifton Webb. It was a featured song in the 1953 movie The Band Wagon, where it was sung by Fred Astaire and Oscar Levant. Even though the original title was “I Guess I’ll Have to Change My Plan,” it more often sung with Plans. 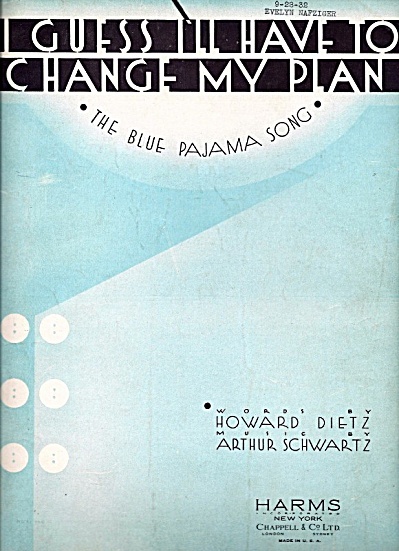 And in spite of the sub-title on the cover of the sheet music, I have no idea what the blue pajama business is all about. “I Guess I’ll Have To Change My Plans” was recorded on January 3, 1959 and was released in 1959 on Basie/Bennett. The song was arranged by Ralph Sharon. “I Guess I’ll Have To Change My Plan” was recorded in July 1993 and was released that year on Steppin’ Out. It was arranged by Tony Bennett and Ralph Sharon.